United Nations, Oct 22 (IANS) The World Health Organisation (WHO) on Sunday announced that Zimbabwe President Robert Mugabe’s appointment as its Goodwill Ambassador has been cancelled. After days of scathing criticism from around the globe for naming Robert Mugabe a Goodwill Ambassador for health, WHO Director General Tedros Adhanom Ghebreyesus said he had “reflected” on the appointment, The New York Times reported. “I have listened carefully to all who have expressed their concerns, and heard the different issues that they have raised,” he said. On Wednesday, at a global conference in Uruguay on non-communicable diseases, Tedros, an Ethiopian and the first African to lead the United Nations’ health agency, said he was “honoured” to be joined by Mugabe, 93. Tedros said Mugabe could use the role “to influence his peers in his region” when it came to fighting non-communicable diseases such as heart attacks, strokes and asthma in Africa. He also praised Zimbabwe as “a country that places universal health coverage and health promotion at the centre of its policies to provide health care to all”. The reaction was swift and unforgiving. Prime Minister Justin Trudeau of Canada joined a chorus of world leaders, the US State Department, medical professionals and social media users who expressed outrage or puzzlement at the appointment. 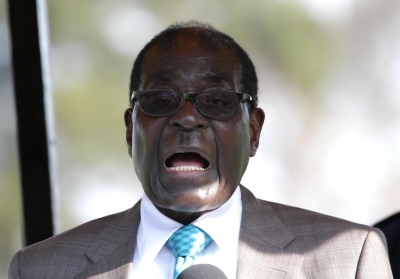 Trudeau told reporters he thought the choice of Mugabe was “a bad April Fool’s joke”, according to media reports. Twenty eight health organisations, including the NCD Alliance which works with the WHO and other global groups to battle non-communicable diseases, released a statement expressing “shock” at the appointment. Under Mugabe’s rule, critics say, the country’s health care system, like many of its public services, has suffered badly, with hospitals frequently lacking essential supplies and nurses and doctors regularly left without pay.